Townsend is part of Tuckaleechee Cove, a beautiful valley at the border of Great Smoky Mountains National Park. The name comes from the Cherokee Indians and means “peaceful, green place”. Tuckaleechee Cove, like Cades Cove and Wear Cove, was formed ages ago when mountain building forces pushed older layers of rock (slate and sandstone) on top of younger layers of rock (limestone). As time passed, weathering and erosion opened up the coves or “windows”. So, geologic processes produced the lovely mountain valleys we see today and over time yielded productive lands for wildlife and for human settlement. To see the results of water flowing and dripping underground, visit Tuckaleechee Caverns. Enjoy the wildlife and history of spectacular Cades Cove, in Great Smoky Mountains National Park! Want to learn as you go, enjoy the scenery, and let someone else drive? For a fun and educational trip led by a knowledgeable guide in a comfortable, fuel efficient 19 passenger van, take the Cades Cove Heritage Tour, leaving from a parking area adjacent to the Great Smoky Mountains Heritage Center in Townsend. Flowing out of Great Smoky Mountains National Park, with headwaters above Elkmont, is the Little River. Little River became famous far beyond the regional area in which it flows by playing a large part in railroads. There is a Little River Railroad and Lumber Museum located in Townsend dedicated to preserving the heritage and showcasing the innovations that came from the area. 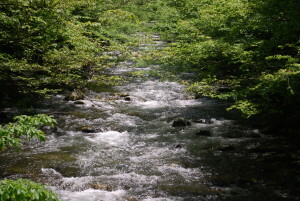 Since the forests of the Smokies are a wonderful watershed, the stream is clean, cold, and clear. This means great opportunities for fishing, tubing, kayaking, and canoeing-or just splashing in the river! 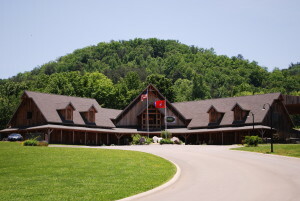 Another institution dedicated to educate and preserve Townsend’s beautiful heritage and natural surroundings is The Great Smoky Mountains Heritage Center. Between gallery exhibits, educational programs and demonstrations there is always something happening at The Great Smoky Mountains Heritage Center. They are open seven days a week and are located under two miles from Highway 321, for detailed directions and hours of operation call 865-448-0044. The Townsend area has lots of green space, where people can stroll or bicycle along the pathways and enjoy views of wooded hills, fields and well-kept homes and gardens on the side roads. A handi-capped accessible picnic area is located by the Little River at the western end of bicycle path. With a combination of open fields, forests, farms, and streams, Townsend, Tuckaleechee Cove, and surrounding areas are wonderful for bird watching. Ducks, geese, and herons swim and wade in the Little River, colorful warblers and other songbirds migrate through the tress in spring and fall, and the Foothills Parkway is a hawk migration route. Cades Cove in Great Smoky Mountains National Park is another excellent birding hotspot. Wildflowers abound in the Smokies! From late February through the end of October, something is blooming–delicate blossoms of the forest floor, spectacular displays of azaleas, mountain laurel, and rhododendron, and the grand finale of the yellow, red, and purple blossoms of autumn.